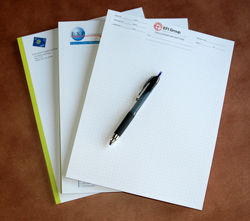 Note pads are critical to your businesses professional appearance. You should never show up at a customers or a client’s office without your own company branded materials. Note pads are just another tool in your marketing toolbox. Businesses today need to use every resource, or channel, they have to present a cohesive and unified appearance. Note pads are economical! Make your note pad work for you—give them away to your clients and let your clients start to spread your word. Don’t be shy, try adding a QR code to you pads. Let everyone know that you’re up to speed with all the latest marketing trends. To ratchet up the effectiveness of your QR code, have it link to a shortened URL so you can track it’s activity. Think about having the QR link to a fully mobile compatible web page or site. We advise our clients to sell themselves wisely. These are just a few tips and tricks you can teach your note pads. Any one of these tips could be just the ticket to differentiate you from the competition and land that big job or contract. Now what’s the value of your custom branded note pads? If you have any questions about this article, need note pads, questions about mobile website , just give us a call and mention code: NOTEPAD-10 and we will give you a 10% discount on your next note pad print order. Previous post: Email is more environmental than Print? Next post: Importance of high quality printing for professionals.